For the first time ever, we've assembled an unparalleled group of our industry’s most interesting, and sometimes outspoken, business leaders and invited them to share a message with dealers designed to help further their success—and we're putting them on stage at Summer NAMM. 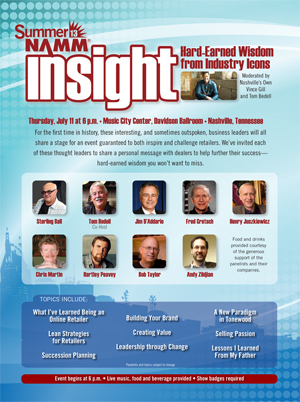 On Thursday, July 11, NAMM presents Insight: Hard-Earned Wisdom from Industry Icons featuring these high-profile panelists: Sterling Ball, Jim D'Addario, Fred Gretsch, Henry Juszkiewicz, Chris Martin, Hartley Peavey, Bob Taylor and Andy Zildjian. Moderated by country music legend Vince Gill and Two Old Hippies’ Tom Bedell, this event delivers hard-earned wisdom you won’t want to miss! Join us in the Music City Center's Davidson Ballroom where all NAMM Members will enjoy free food and beverages from 6 p.m.–7:30 p.m. (first come, first served). The event begins at 6:30 p.m. Live music follows at 7:30 p.m.–8:30 p.m.